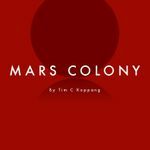 Mars Colony is a roleplaying game designed specifically for two players. One will take on the role of the colony’s appointed "savior", while the other will be responsible for all the various problems that are plaguing the citizens of Mars. As the game progresses, the savior will face a constant struggle between competence and failure, honesty and deception. It is a game custom built to explore the cult-of-personality present in modern-day politics, but playable in the time it takes to watch a long movie.